This painting started out in my mom and dad's back yard. I literally sat outside for a bit and painted - it's called a Plein Air technique. Plein Air you use a quick drying medium like Liquin and Turpenoid so you can paint what you see quickly. I definitely do not finish a painting during the outdoor session. Instead, I get to a good stopping point, take several pictures and bring the painting into my "studio", aka craftroom. You've probably seen pictures of people standing around with their easel outside painting a beautiful ocean, tree, garden etc...I feel goofy doing that by myself. I've done it with classes and LOVE painting outdoors, but, like I said, by myself I feel goofy, especially with people walking by - most people don't know the process it takes to get to a finished product and are quick to judge. I guess I'm still sensitive to what others may think of my paintings. Here is the finished product 9" x 12" Oil on Canvas. I call it "Promise". 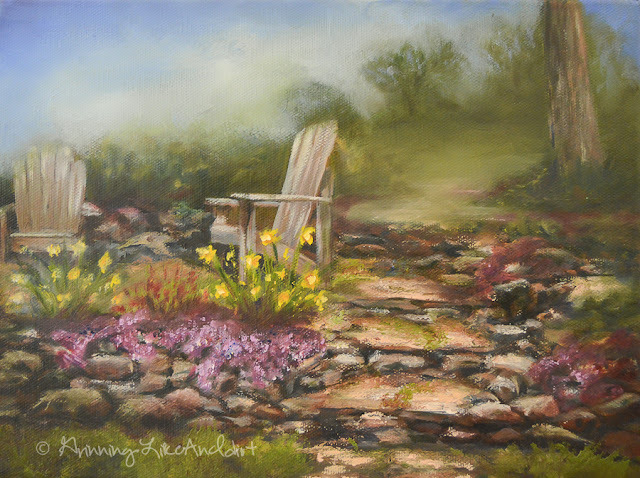 When I started the painting I didn't know what I'd call it, all I knew is I loved these chairs. The chairs are waiting for two people to sit together and talk with one another. In my parent's backyard there is a fence behind the chairs that I took out, because I wanted to expand on the feeling that the chairs gave me. So, I started a dream-like path going to somewhere but nowhere we can see. When it was done I thought about the Promise my husband and I made to each other, until death do us part, and until then we will be by each others side walking together down a path that we aren't sure where we are going but we'll do it together.